This biopic about the King and the historic White House meeting is stretched far beyond its flimsy premise. Inoffensive as it is inconsequential, this foray into filmmaking from director Liza Johnson (Hateship Loveship) is a painful disappointment from start to finish, a frustratingly safe and unimaginative effort that squanders the potential of its story. In Johnson’s defense, there wasn’t much ripe material to bungle here. 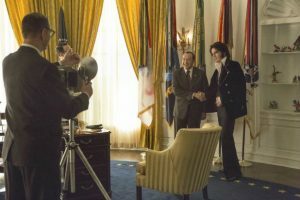 The log-line is simple: billed as an “untold true story,” the movie chronicles the two days leading up to the monumental meeting between Elvis Presley (Michael Shannon) and President Richard Nixon (Kevin Spacey). Interest in this unlikely encounter stems from an iconic photograph taken Dec. 21st, 1970, which finds Nixon ( grinning) and Presley (in a daze) shaking hands. (2) LOVING YOU (July 1957) The success story contained in Loving You closely resembles the rise to fame that Elvis was experiencing at the time. His character, Deke is introduced as a delivery boy who discovers a natural talent for performing and soon reaches national attention as a singer. In contrast to Love Me Tender Elvis appears in nearly all the scenes of Loving You, and its the only color Elvis movie from the 50s. 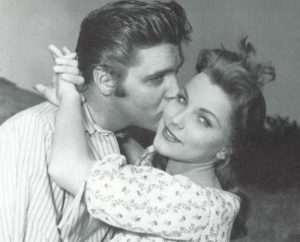 Elvis story is presented on-screen in Loving You as a wholesome tale of success helping to transmit the idea that he was not such a threat to middle America after all. The soundtrack is packed with songs, establishing a formula where Elvis music promoted his films and vice versa. There are many outstanding musical performances in the film, along with a number of impressive acting moments. (3) JAILHOUSE ROCK (November 1957) This is considered by many critics to be Elvis most classic film. Coming at the height of his 50s popularity, he portrays a cynical ex-convict turned pop-singer. Elvis received $250K plus 50% from the profits of the film that grossed just under $4 million, ranking #4 for the year. Elvis’ dialogue features the latest slang & his wardrobe was cutting-edge rock-n-roll fashion. His manner and dress did much to reinforce his rebel image. Elvis had told the press when he first came to Hollywood, I took this screen test where I was real happy, I didnt like that. Then I did other one where I was mad at this guy and I liked it better. It was me. Jailhouse Rock must have been the role Elvis was waiting for. (4) KING CREOLE (July 1958) was Elvis personal favorite. Based on the Harold Robbins novel A Stone For Danny Fisher, King Creole is a dark suspense-filled tale of troubled teenager who grows up quickly after a brush with societys worst element. The role was reportedly once offered to James Dean. Shot on location in New Orleans, King Creole boasts an all-star cast including, Walter Matthau, Dean Jagger & Carolyn Jones. Michael Curtiz of Casablanca fame was the director. 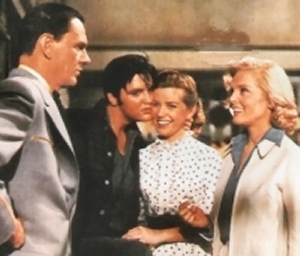 King Creole earned Elvis favorable reviews as an actor, but drew the lowest gross for his 4 films in the 50s. The script is filled with complex scenes that allowed Elvis to explore a full range of his acting abilities. King Creole hinted at a movie career that was never to be for young Elvis Presley. Many believed that this impressive acting performance, he had opened the door to play additional dramatic roles. Unfortunately, this was never to be the case.